Ex-Newcastle boss John Carver insists the club's board did not tell him to leave Jonas Gutierrez out of the side. The Argentine claims Carver did not start him to avoid triggering a 12-month contract extension. "All selection decisions were taken independently by me," Carver told an employment tribunal on Tuesday. "The board were not even made aware of my thoughts on team selection until a couple of hours before the match. "Even if the board had wanted to prevent me from selecting any particular player, including Jonas, it would have been very difficult for me to find an alternative first-team player because of injuries." Gutierrez signed a four-year contract in September 2011, which would automatically be extended by a year if he started 80 games during that time. However, the midfielder claims once he was diagnosed with testicular cancer, the club saw him as a liability and took steps to make sure he would not be offered a new deal. When he was released by the Magpies in May 2015, he had only started 78 matches during the contract period. "If Jonas did have concerns that the club was treating him unfairly because of misconceptions it had about his cancer, I am very disappointed that he never raised this with me," added Carver. "My mother passed away from cancer four years ago and I was particularly sensitive to Jonas' situation." Carver was put in temporary charge of Newcastle in January 2015 following Alan Pardew's departure to Crystal Palace. He was eventually sacked at the end of the 2014-15 season, despite keeping the club in the Premier League. Pardew, who gave evidence at the tribunal last Thursday, said he thought Gutierrez had "massive grievances" with Newcastle when he returned after his initial cancer treatment. And it was revealed during Tuesday's hearing that Gutierrez was involved in a training ground disagreement with Carver last April which resulted in him being left out of the squad for a game against Tottenham. "Jonas was displaying a general lack of care to what he was supposed to be doing and this ended up in me having to ask him four times for his attention," said Carver. "Due to his attitude, I asked him to leave the pitch and he then approached me using foul and abusive language and throwing his top off. "I sent him back to the changing rooms and as he was walking off he still continued abusing me." Carver said Gutierrez apologised a few days later and that was the "end of the matter as far as he was concerned". 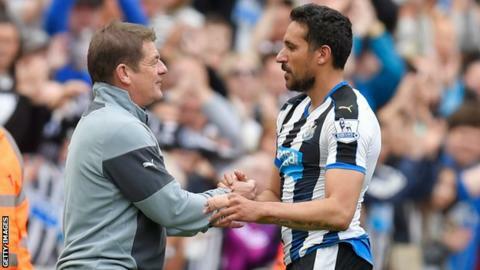 After Newcastle survived relegation from the top flight with a 2-0 victory over West Ham on the final day of the 2014-15 campaign, Carver said he was asked whether Gutierrez should be offered a new deal. "My opinion was that Jonas should not be offered a new contract as there were better players available to take the club forward," said the 51-year-old. Carver said Newcastle's managing director, Lee Charnley, then asked him to speak to Gutierrez and Ryan Taylor to tell them they were being let go, but could not get hold of Gutierrez. "I spoke to Ryan Taylor. He told me he was on a coaching course in Northern Ireland and when I mentioned that I was also trying to get in touch with Jonas he stated he was also on the course and did I want to speak to him," said Carver. "I said I did and I explained he would not be getting a new contract. Jonas took this news calmly and didn't raise any issues." Gutierrez later said the club made him feel like "they did not care" after releasing him over the phone. "While I would have preferred to give Jonas [and Ryan] this message face to face, it was not possible in the circumstances as I had been asked by the club to deliver the news as soon as possible," added Carver.